I still remember the first time I saw the granite spires of Bugaboo Provincial Park 11 years ago. We had planned a September backpacking trip to the Conrad Kain Hut with friends and it was our first visit to this provincial park in the Purcell Mountains of Southeastern British Columbia. Going over a rise on the drive in, we caught our first glimpse of Hounds Tooth Spire and Marmolata Peak, and promptly jumped out of the vehicle, mouths wide open! "Did we suddenly get teletransported to Patagonia" I remember asking? "There's no way we're in Canada anymore" was next out of my mouth. 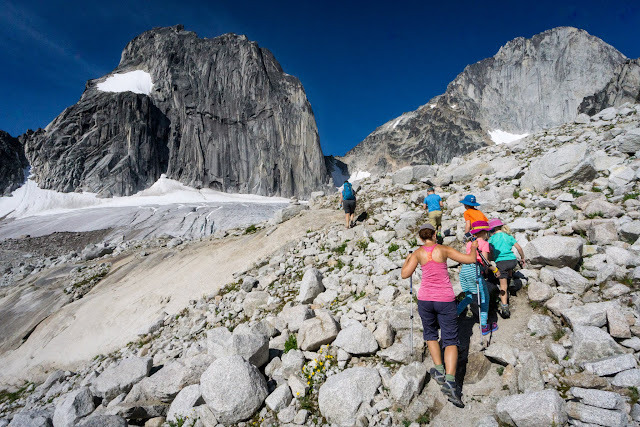 I still get the same feeling that I'm been whisked off to South America every time I visit the Bugaboos, even now after my fourth visit, and I am pretty sure I could never become complacent with this park's beauty no matter how many times I return. 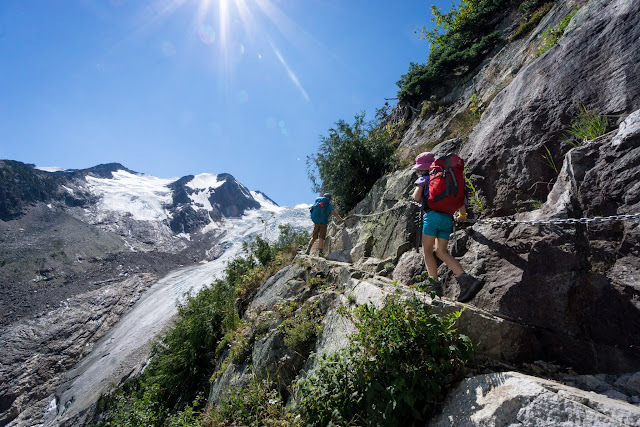 One thing that has changed over the years though is that "Bugaboo weekend" doesn't have to equate to "climbing weekend." We've just tackled our first family trip to the Conrad Kain Hut this past summer and it was every bit as enjoyable as previous adult trips. We spent a free day at the hut traversing the wildest terrain our son has experienced yet, and did our first glacier walk as a family (something I never imagined we'd be doing with a 7 year old!) We enjoyed scrambling around the Applebee Dome Campground above the hut, sent the dads off to do a fun little scramble up East Post Spire (the first spire that we'll attempt as a family in another year or two,) and entertained ourselves just playing on giant boulders outside our cozy cabin. Bugaboo Provincial Park is located between the towns of Golden and Radium Hot Springs in Southeastern British Columbia.You start your trip from the small town of Brisco, where you leave Hwy 95 and switch to gravel roads for the next 50 kms. 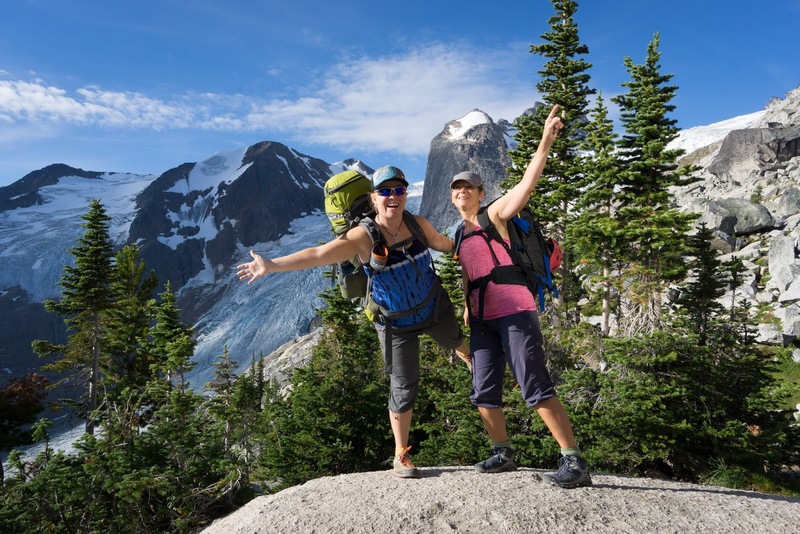 To note if it's been a while since your last trip to the Bugaboos, the road has improved a LOT. Back when we first visited the Bugaboos, you really did need a 4x4 truck. Today you can make it in with pretty much anything if you drive slowly and proceed with care on the rough sections. Also, you don't need to bring your own chicken wire and stakes anymore. There are bins in the parking lot where people are encouraged to leave their used wire for the next user (and they were full.) I'd still encourage you to bring wooden stakes or long pieces of wood though if you have anything kicking around the house. While there certainly are other hiking trails in the park, the one up to the Conrad Kain Hut is definitely the most popular. It's also the hike that will get you closest to the granite spires, and at 4.6 km in length, is definitely doable as a day trip. 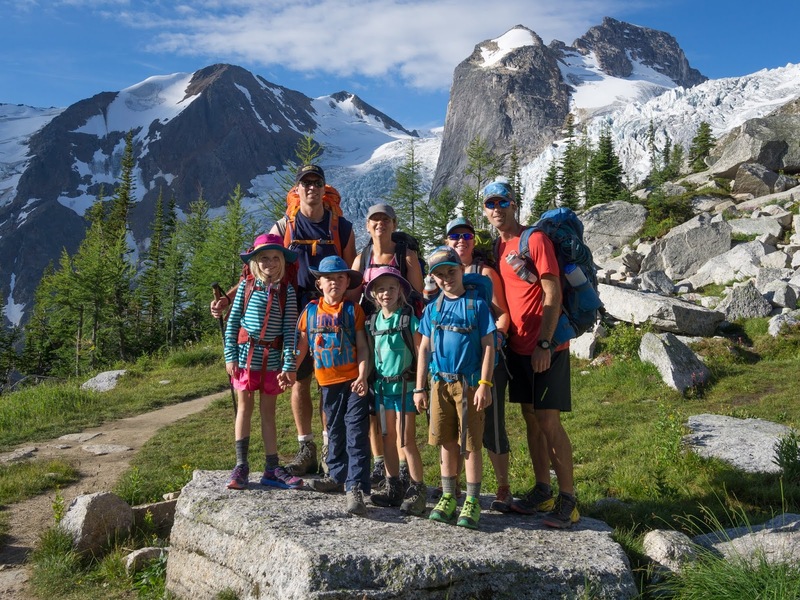 We could have hiked in for the day to introduce our gaggle of kids to the Bugaboos, but why would you when there's a gorgeous backcountry hut perched on a bench overlooking the glacier and several large spires including Snowpatch and Hounds Tooth! While much of the hike is just "steep walking" on a very well maintained trail, there are a few narrow sections with hand lines and cables. I imagine climbers with heavy packs appreciate the extra security if they are feeling unstable with the weight on their backs. Our kids however, were fine and didn't seem too phased by the narrow ledges we had to traverse. My husband briefly put our son on a length of short rope on the way up but we quickly realized it wasn't necessary at all. For the kids, the highlight of the hike in was the giant ladder that they had to climb to get up a cliff blocking our way to higher slopes. The ladder is permanently bolted in place and very secure. We still kept a careful watch on the kids though and tried to place an adult right behind the youngest children. Ladder and ledges aside, it was a beautiful hiking trail and not terribly challenging. If I had to choose the hardest thing about this trail I'd actually say that it's the heat!! It gets pretty intense on warm days when you're down in the trees on this trail. Reaching the upper ledges is actually a relief because you finally get a breeze. It doesn't get much fancier than the Conrad Kain Hut for backcountry "camping." 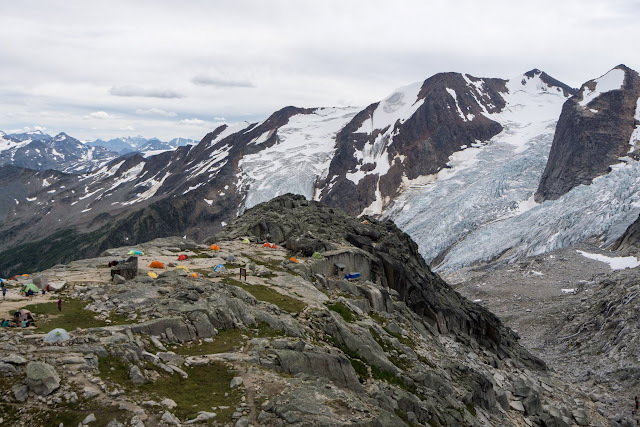 Maintained by the Alpine Club of Canada under the jurisdiction of BC Parks, this is the only ACC hut that can boast of having electricity, hot running water, lights, and heat! 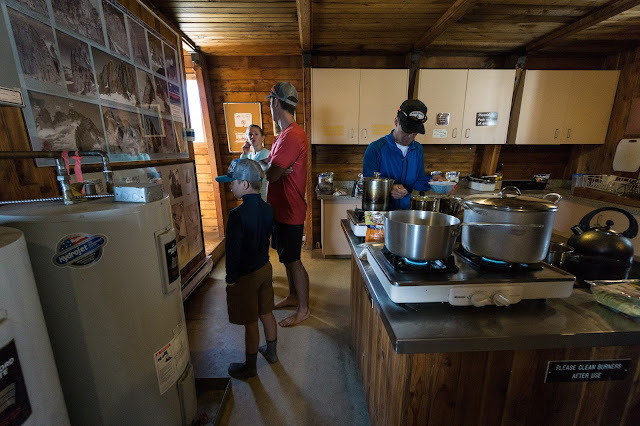 Thanks to a pretty awesome hydro generator, one could easily be fooled into thinking they were in a front country hostel or lodge while staying at the Conrad Kain Hut. You can walk into the kitchen, turn on a tap, and wash your dishes with clean hot water. You can fill your water bottle straight from the tap (no filtering required!) When it's dark, turn on the lights (no propane lanterns here.) And when it starts to cool off at night, the heaters come on guaranteeing a toasty warm hut stay. The only challenge with staying at the Conrad Kain Hut is knowing that the next hut you stay at will feel very primitive by comparison. 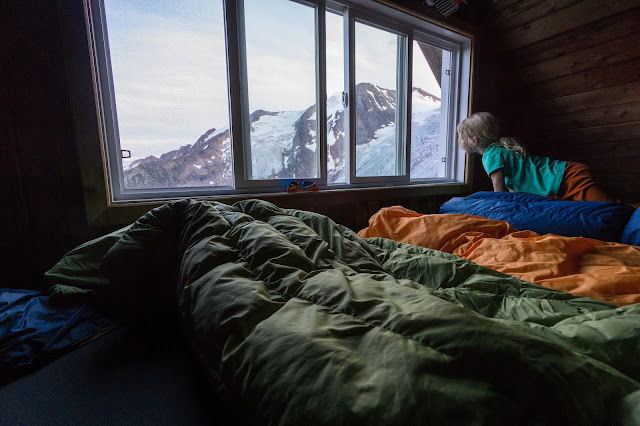 Unlike a luxury hotel, you will be sharing sleeping accommodations at the hut but you can't really expect much more in the backcountry. And at $25.00 a night per person ($50.00 per family,) I'm ok sharing a bedroom with a few strangers. Fortunately, there are two floors or levels to spread yourselves out on for sleeping and both are above the main cooking and living area. This isn't one of the smaller huts where you'll sleep, eat, and hang out all in the same room. (thank god!) If your child goes to bed early, just put him or her down on the top floor far away from the main area, and they won't hear a peep. For more information on the hut and what to bring, visit the Alpine Club of Canada's website. One doesn't have to go far to get good views from the hut. Simply look out the windows from the tables where you're playing cards, walk outside to the bathrooms, or take a short jaunt through the boulder gardens towards the Bugaboo Glacier. Our kids loved playing on the huge boulders and practiced a bit of climbing on the biggest one beside the hut. I'm pretty sure we could have actually spent the whole day just playing outside the hut without going anywhere for a day hike. Want to actually go exploring while at the hut? Applebee Dome it is then! The climbers base camp is perched a kilometre above the hut on giant rock slabs. It's an impressive campground to see and the setting is pretty hard to beat for views of the various climbing objectives surrounding the dome. 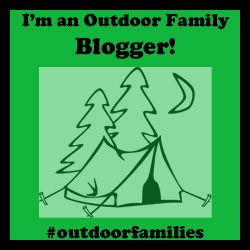 We took the kids up the well maintained path towards the campground and wow has this trail improved since I first hiked it 11 years ago!!!! I warned everybody about how hard it would be to hike back down at the end on the slippery gravel trail, only to find that they'd carved out rock steps and made it into a pretty decent hiking trail! Thank you to everybody who helped with that!! We didn't go all the way to the campground but cut off earlier towards the Crescent Glacier and the Bugaboo-Snowpatch Col. We had no intention of taking the kids anywhere dangerous but knew we could safely do a small circuit around the area, traversing the glacier, and returning via the campground for a round trip distance of roughly 7 km. Crossing the glacier was definitely the highlight of the outing and I have dozens of photos I could share! I had never thought of taking kids as young as as 5 - 10 years old on a glacier traverse but the Crescent Glacier was the perfect choice for a family outing. The part that we were on was flat, crevasse free, and without any technical difficulties. Those who had helmets wore them but we were not in any danger from rock fall so they weren't needed in any way. 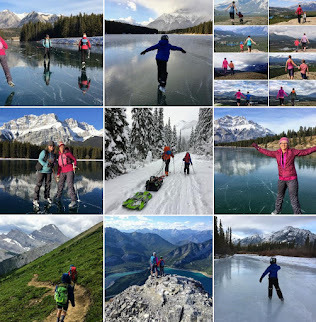 We did put ice cleats on every child and adult though so that there was no risk of slipping and falling into the melt water pond at the bottom of the glacier. The kids had a blast running around on the glacier and it's probably the only time in their lives that they'll get to "play" on a glacier without being tied into a rope, without having to follow safety protocol, or without having to walk single file following a leader. The kids ran wild and free across the glacier and it was magical to see. Our only challenge now is finding another equally "safe" glacier to play on next summer! I'm not sure we'll find one. 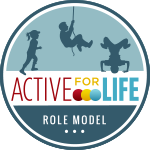 Such great models these kids make! Summer Goal: Walk on a Glacier - check! We also had to get around a small pond which ended up being a bit sketchy in spots (cliffs ending in water on one side, snow ending in water on the other side.) I'm happy to say though that nobody fell in! I was so proud of our kids and of how well they did on this wild and crazy adventure in the Bugaboos. There were definitely challenging moments but they rose to the occasion and kept good attitudes through most of it. The Best Part about the Trip - the Friends! The hike out from the hut took roughly 2 to 2.5 hours (not much shorter than the hike in actually) and was uneventful, always a good thing. Best of all though, we'd made new friends on our trip that I hope to do many more trips with in the future. I'd been collaborating and partnering with Alyssa of the blog, Kid Project, for several years, and this was our first time meeting in person, Utah and Calgary not exactly being neighbors. Alyssa and I already knew we'd love each other when we met but fortunately the kids all got along fabulously as well and we ended up spending many days in the mountains together while they spent a month in the Rockies this summer (those stories still to come.) Our husbands even got along super well and got to spend a day doing some multi pitch climbing in August. Want to plan your own trip to the Conrad Kain Hut? 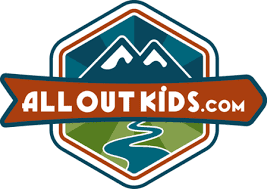 Please visit the Alpine Club of Canada's website for more information on booking huts. 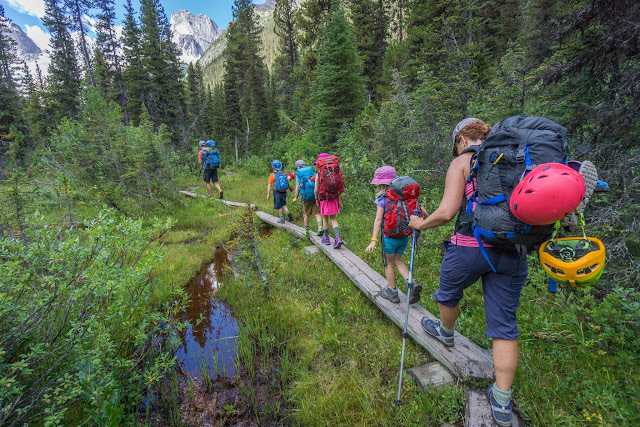 You'll need to be a member to make an advanced booking at most huts but reservations at the Conrad Kain Hut don't require membership since it is under the jurisdiction of BC Parks and not located in a national park. You can make a reservation for the Conrad Kain Hut now for next summer and I'd recommend booking early for prime summer spots. 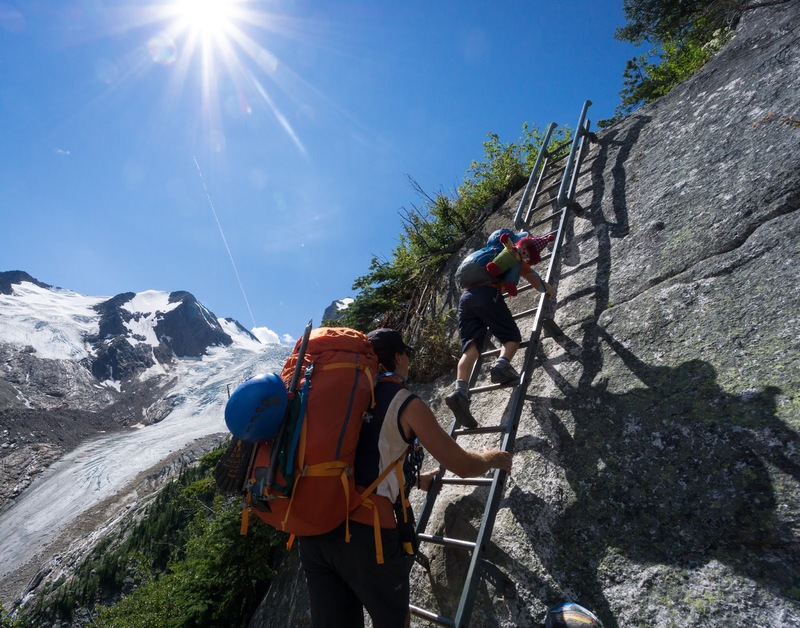 To read Alyssa's trip report and see more of her photos (some featured in this story) follow this link to Backpacking into the Conrad Kain Hut, Bugaboos.